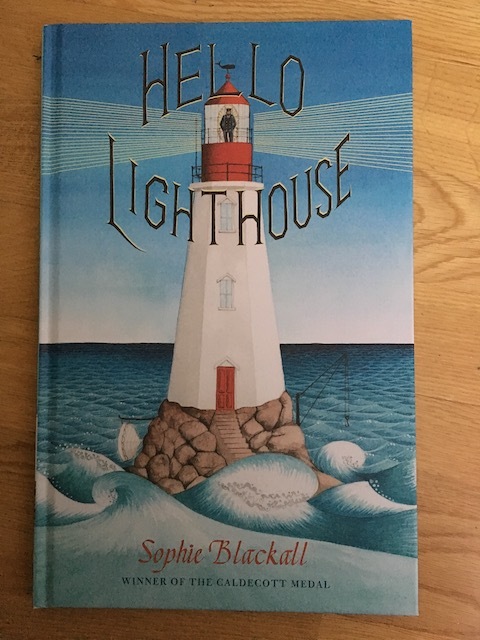 Hello Lighthouse by Sophie Blackall is a new picture book that can transport young readers to the seaside through the eyes of a lighthouse keeper and his family. Hello Lighthouse is published on 7th February 2019 by Orchard Books. When I was reading this wonderful story to pre-school children of the London Mums’ kids’ club I started pretending to live the story along with the characters. Children love to pretend and dream and I still love it too. Hello Lighthouse is perfect to allow you the imagination game. With beautiful and evocative illustrations the book transports you to the seaside and its life filled with wind and see breeze blowing, waves and fog rolling in, and icebergs drifting by. Outside the lighthouse, there is water all around. Inside, the daily life of a lighthouse keeper and his family unfolds as the keeper boils water for tea, lights the lamp’s wick, and writes every detail in his logbook. Personally, I find the image of the lighthouse beacon guiding ships safely by very fascinating. Hello Lighthouse might be a picture book for young children but it is an inspiring depiction of the life of a lighthouse keeper and suitable for all ages including parents and grandparents. The author’s note at the end of the book provides lots of facts about the lighthouse and the lighthouse keeper’s life for those readers who want to know more. Some of the section illustrations of the lighthouse are really interesting. Sophie Blackall is the illustrator of many picture books, including Finding Winnie: The True Story of the World’s Most Famous Bear – winner of the prestigious Caldecott Medal. She lives with her family in New York, but keeps an eye on lighthouses for sale, just in case. This entry was posted on Friday, January 18th, 2019 at 11:55 am and is filed under Books. You can follow any responses to this entry through the RSS 2.0 feed. Both comments and pings are currently closed.